While millions of Americans celebrated the nation's birthday with fireworks and amusement park rides, Corvette Racing spent the weekend after the Fourth of July on the roller coaster 1.54-mile Lime Rock Park circuit. Oliver Gavin and Olivier Beretta avoided the heavy holiday traffic on the congested road course and scored a .384-second victory in their No. 4 Compuware Corvette C6.R over Johnny O'Connell and Jan Magnussen in the No. 3 Compuware Corvette C6.R. Gavin and Beretta completed 165 laps and finished eighth overall. It was the pair's fifth win in six ALMS races contested this season. "This is the smallest, narrowest, bumpiest, and craziest track we race on," said Gavin after notching his 25th career ALMS victory. "When you have the prototypes driving up behind you with a lot of pace on the straights and GT2 cars with great speed in the corners, you have to keep your wits about you all the time. It's very satisfying to come back to America and get a victory in our first race after Le Mans." Gavin and Beretta led from flag to flag as the two Corvettes were never separated by more than a few seconds throughout the two-hour, 45-minute race. The grid was set by practice times after rain cancelled qualifying. Beretta and O'Connell drove the first stint, and were replaced by Gavin and Magnussen respectively in the first round of pit stops at 1:21 into the race. Both drivers then made routine pit stops under caution at 2:05 for fuel and tires to take them to the finish. The race was interrupted by three full-course caution periods, and both Corvettes showed the scars of close-quarter combat after the race. "It was like riding a bicycle in the middle of a highway with trucks and cars all around you," Beretta explained. "Staying out of trouble was not easy, but (crew chief) Ray Gongla did a terrific job of spotting for me in the pits. It was difficult to stay out of trouble because of the traffic, but both cars are in one piece, and that was the goal." Beretta extended his record for career ALMS victories with his 33rd win. The "two Ollies" now unofficially lead the GT1 drivers championship by 32 points. "Any time you leave Lime Rock with both cars intact it's been a successful weekend," observed O'Connell. "We had a really good hot rod, both cars finished nose to tail, and the pit crews performed to the standards that we're used to. It's getting frustrating for the No. 3 Corvette, and I'd hoped we'd turned the corner with our win in Houston. So now we go on to Mid-Ohio and hope for better luck." Magnussen was happy to have survived his first race at Lime Rock Park. "The prototypes are dive bombing you all the time - most of the time you see them, but sometimes you don't," said the Dane. "We got hit a couple of times, but nothing happened to my Corvette because it's a strong car. It's fun to drive here but difficult to race here." After the disappointment of finishing second in the 24 Hours of Le Mans, the flawless run at Lime Rock was tonic for the Corvette Racing team. "Too bad it wasn't like this at Le Mans," said team manager Gary Pratt. "A great team just comes back and fights hard at the next race. Hats off to the engine guys, they did a great job this weekend. The pit stops were perfect and that's the way you wish every race would run." Corvette Racing program manager Doug Fehan reflected on another flawless performance by America's premier production sports car team: "At the end of the day these guys finished a couple of tenths of a second apart, and it's just incredible to think they can do that race after race," he said. "Other teams have tried to accomplish that and can't seem to do it. Today was a testament to the work that Corvette Racing has done." 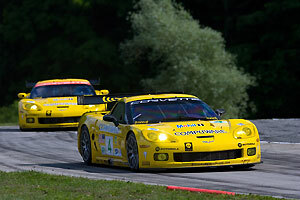 Corvette Racing's next event is the Acura Sports Car Challenge at Mid-Ohio Sports Car Course on Saturday, July 21. The two-hour, 45-minute race will start at 3:15 p.m. CBS Sports will televise the race tape-delayed at 2 p.m. EDT on Sunday, July 22.